Acacia Vineyards is not only committed to crafting delicious wines, but prides itself on their efforts to preserve and restore the wetlands of the Carneros district. When Winemaker Matthew Glynn joined Acacia Vineyard's winemaking team in 2005, it was as though a hand slid effortlessly into a perfectly fitting glove. Matthew's understanding of Burgundian winemaking is two decades strong. While a graduate student in viticulture and enology at UC-Davis, he had received a laureate award from the Confrérie des Chevaliers du Tastevin, France's famous wine brotherhood, to study winemaking in Burgundy. He gained expertise in Pinot Noir and Chardonnay while working in the cellars of Domaine Bouchard Pére et Fils, Domaine de l'Arlot, and Domaine Dujac. So it is no surprise that when Matthew returned to the United States, he yearned to work with the Burgundian varieties he had so carefully studied. He didn't hesitate when the opportunity to join Acacia presented itself. 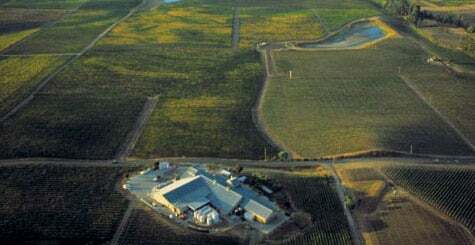 After all, Acacia was one of the first California wineries to develop a fine reputation for Pinot Noir made with vineyard-designated grapes. Through the years, it acquired additional land, and today Acacia sources its own 150-acre estate vineyard as well as other Carneros single vineyards for its richly styled Pinot Noir and Chardonnay. The Carneros region, which borders the southern tips of the Napa and Sonoma valleys, is transitioning from pastureland to vineyard property as its potential for distinct Pinot Noir and Chardonnay is further realized. "My goal here is to elevate the wines, to give them everything they need to fully express their Carneros origins," Matthew says. The winery's commitment to Carneros goes beyond its winemaking style. Acacia Vineyard is also working to help restore 13,000 acres of wetlands that abut the Carneros district. The wetlands are an important habitat for many fish, wildlife, and plant species--some threatened or endangered. There's even a special Acacia Marsh Chardonnay dedicated to the cause. Proceeds from the wine, sold exclusively in the tasting room, go to the improvement of the wetlands. Acacia Vineyard believes that by showcasing the region's character and protecting its natural environment, it is setting the stage for the appellation's emergence as a world-class wine region. Take Hwy 101 to Hwy 37. Follow Hwy 37 east to Hwy 121. Turn left (north) onto Hwy 121, then right on Duhig Rd. Take Duhig 1.5 miles, then turn left at Las Amigas Rd. The winery is on the left.